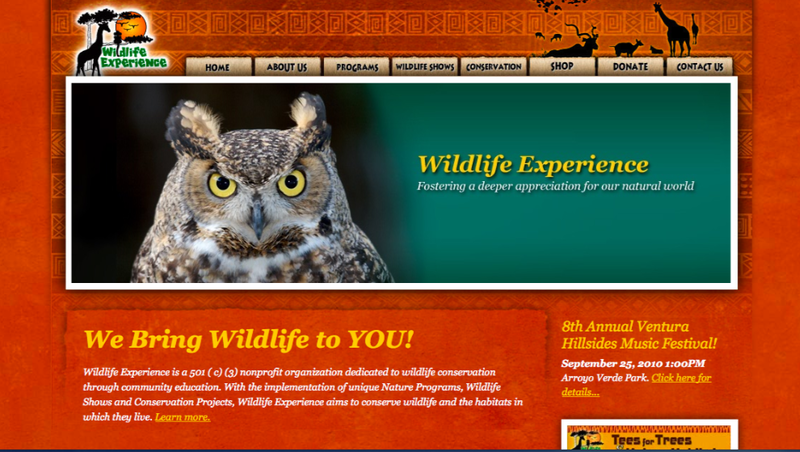 Today, Beverly from Wildlife Experience was in our class. 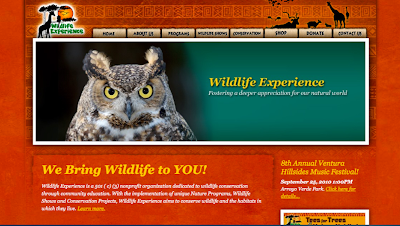 She runs a non-profit wildlife education organization that brings native and exotic animals to schools and teaches children about the importance of our natural world. To book a program for your southern California school or order a t-shirt, click here. 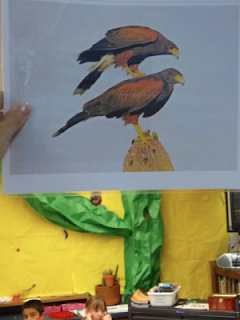 A Harris hawk has a wingspan of about 3- 4 feet. The female is larger than the male. In captivity, the Harris hawk lives up to 14 years. In the wild, they don't live much beyond 10 years due to predation and diseases.The Harris hawk has keen eyesight. 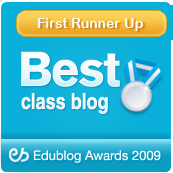 Can someone share the fact Ms. C. shared about a hawk's eyesight? Most hawks hunt alone. 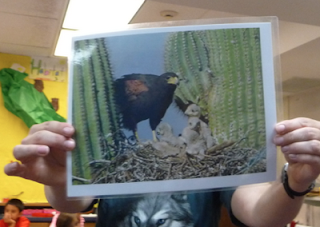 For example, a red tailed hawk might spy a rabbit, grab the animal in its talons, and crush the vertebrate. It will then eat the rabbit. Harris hawks live in the desert. Food is scarce, and they can't afford to miss a meal. Sometimes they will hunt alone like in this photo. 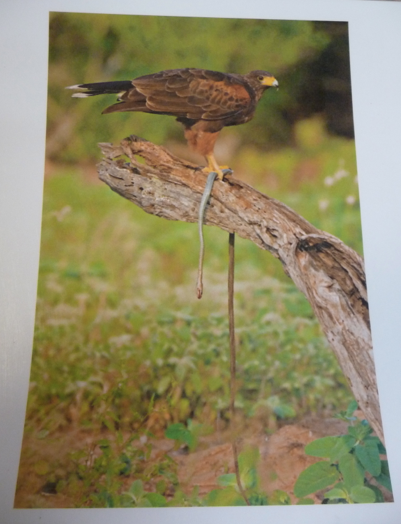 This Harris hawk has captured a snake. Sometimes they hunt together and share a meal. This is a behavioral adaptation. A group of Harris hawks will see a rabbit. One will fly low to flush the rabbit out, which means it will make the rabbit run. All the other hawks will circle the rabbit, capture it, and share the rabbit. Harris hawks also stack on the backs of each other. Ms. C. thinks they do it to bond with one another. No one really knows why they do this. Harris hawks practice communal nesting. That means that some males will feed other hawks in the nest that are not their own. 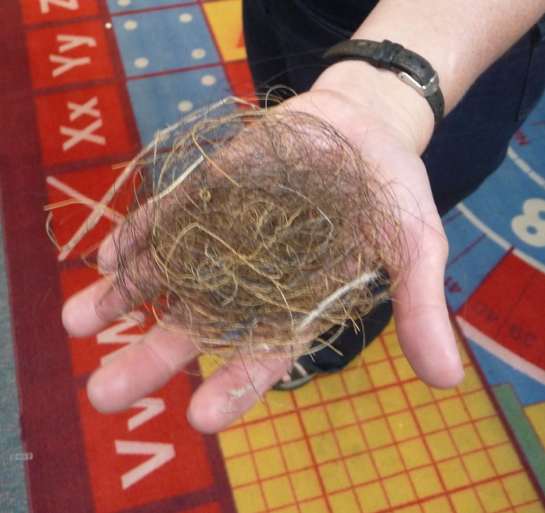 Many birds build nests. Here is a Harris hawk nest. 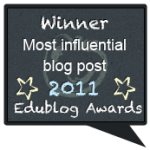 If the nest gets destroyed or blows away, the bird must rebuild it. Birds will pick up anything soft and comfy for their babies. 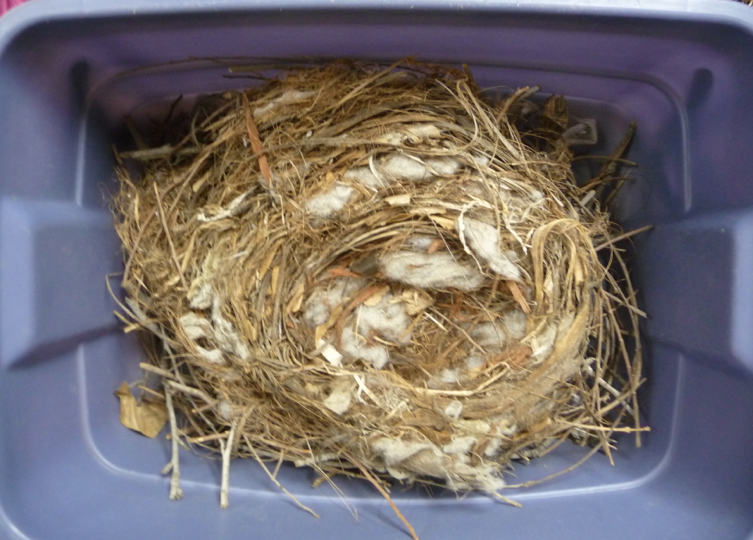 In this nest Ms. C. found: paper bags, newspaper pieces, a piece of a dryer sheet, cotton, animal hair of all colors, along with twigs and grasses. 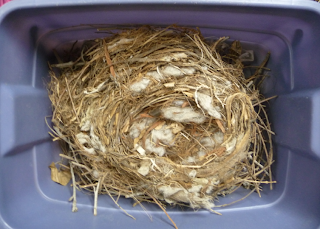 Here is a nest that was started, but not finished. Perhaps a finch started it. This nest is made almost entirely of horse hair! The smallest bird in the world is a hummingbird. 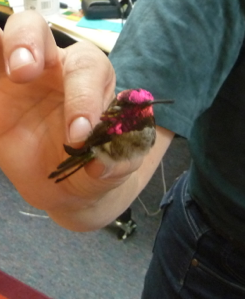 Here are the remains of a ruby-throated hummingbird that was found in the wild. Notice the iridescent coloration. The feathers change color as the light illuminates the bird. Two years ago, Mr. and Mrs. Yollis raised an abandoned hummingbird. See the photos and videos of the rescue! The largest bird in the world in the ostrich. 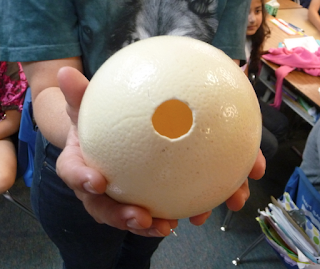 Here is an ostrich egg! 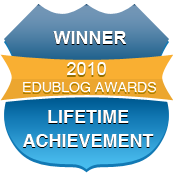 There is an ostrich farm near Santa Maria, California, where students can see live ostrich. Ms. C. drilled a hole in the egg to drain the yolk. 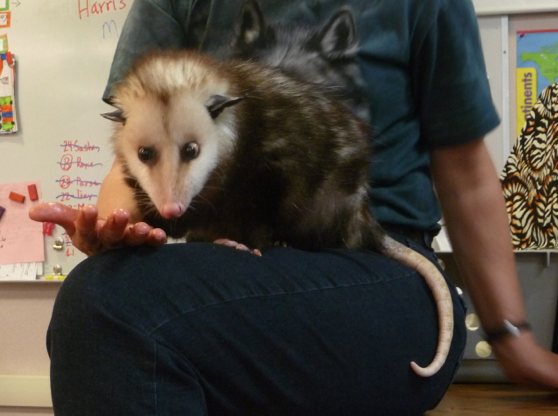 Here is Awesome the Opossum! Opossums are the only marsupials that live in North America. 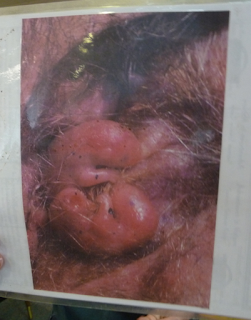 A marsupial is an animal that lives on land and carries its young in a pouch. 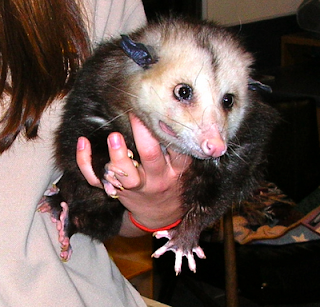 The opossum can have up to 13 joeys, or babies. They are around the size of a dime. 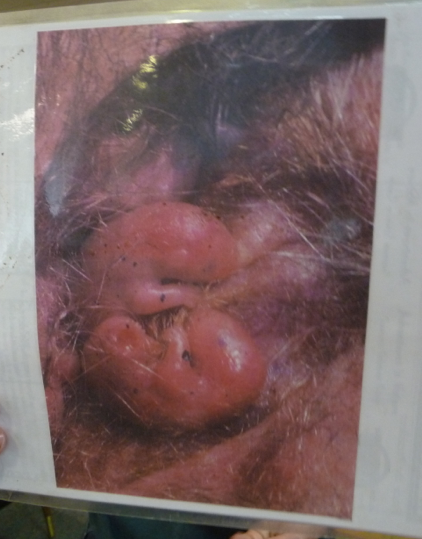 They will live in the pouch for about two months. Here are some newborns! When they get too big, they ride around on top of the opossum. 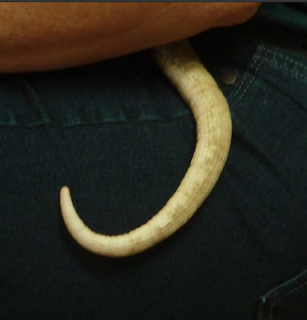 When they finally measure 7 inches from tip to tail, they can be on their own. The opossum is nocturnal, so Ms. C. had to wake her up. She has a prehensile tail that she can use as a hand. Opossums grow approximately 50 razor sharp teeth! Interesting Physical adaptation: When an opossum is afraid, it tries to run. Next it will show his/her teeth. If that doesn't work, a chemical is released that puts the marsupial in a catatonic state. That means it looks dead. 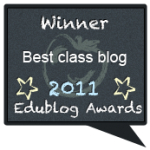 Two scent glands open up and a rotten smell comes out. The opossum looks and smells dead and a predator might leave the opossum alone. After a few moments, she wakes up and takes off! What other marsupials can you name? Please share some facts! Which animal has been your favorite so far? Reading about Ms. C's visit was so much fun. I learned lots of new wildlife facts from her presentation. 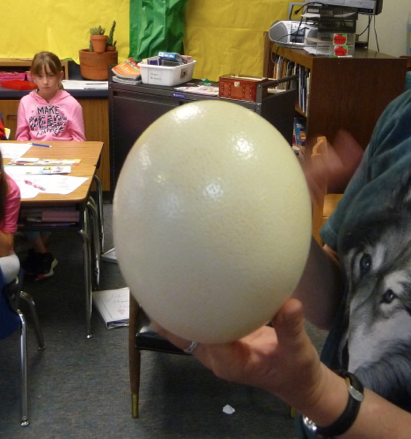 I was very impressed by the size of the ostrich egg. In my estimate, It must fit at least fifty ruby-throated humming birds! 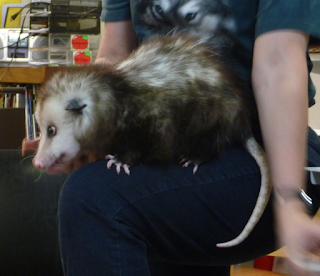 Ms. C. also brought in an adult opossum. I think opossums are so ugly, they are cute. My mom rescued abandoned opossum babies once and they were hissing and biting as she tried to pick them up. The ranger told my mom, that although the babies defend themselves ferociously, they are very smart and some people even have them as pets. 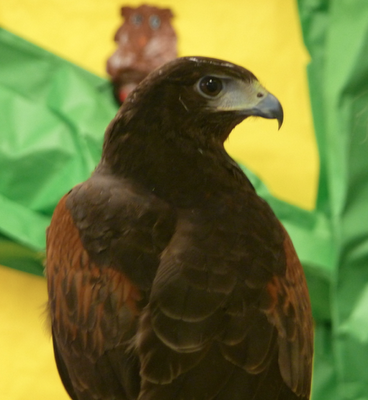 I was also impressed by the Harris Hawk. Harris Hawks are very social birds. Did you know that sometimes their young stay with their family for up to three years and help raising new babies? When I go camping this summer, I hope to see one of these animals! I really enjoyed when Ms. C brought in all of the animals to our class. 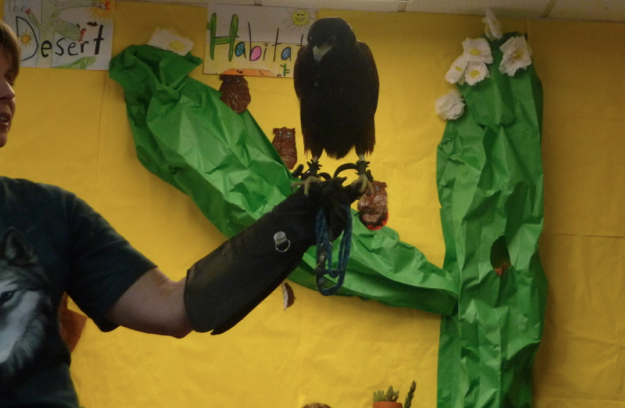 The Harris Hawk was an interesting bird. I liked the pattern on it's wings. We have two gray birds that keep trying to make a nest on our patio. They have tried like 5 times a day for a few weeks now. My mom keeps putting out toys to try and block them, but they just build their nest on top of the toys. They have not come for about 4 days now, so I hope they found a better home. I also really enjoyed the Opposum that came to our class. It was really cute, and I like how he ate his food. My mom tells me that we sometimes have Opposums living in our backyard, but I have never seen them. 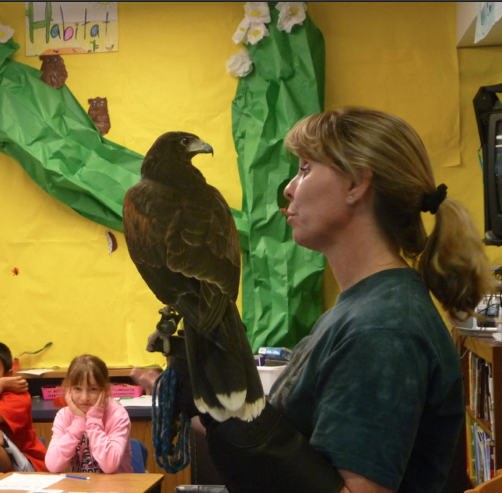 A big thanks to Mrs. Yollis for letting Wild Life Experience bring in the animals. I know three kinds of marsupials, koala, kangaroo, and a numbat. Here are some facts about them: A kangaroo's baby is called a joey. Koalas have wool like fur. Numbats are called the banded anteater. The arachnid that has been my favorite so far is the rose haired tarantula because it is a beautiful six eyed spider. The animals that Mrs.C brought were so interesting. The opossum was so cute. I also really enjoyed the Harris Hawk. I liked the green on his body. He was beautiful! Thank you for sharing yet another encounter with some wonderful animals. It set me thinking about some of Australia's animals. 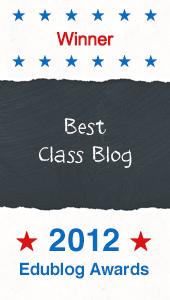 Here is a link to an extended comment I put together for your class and Mrs Ranney's class.